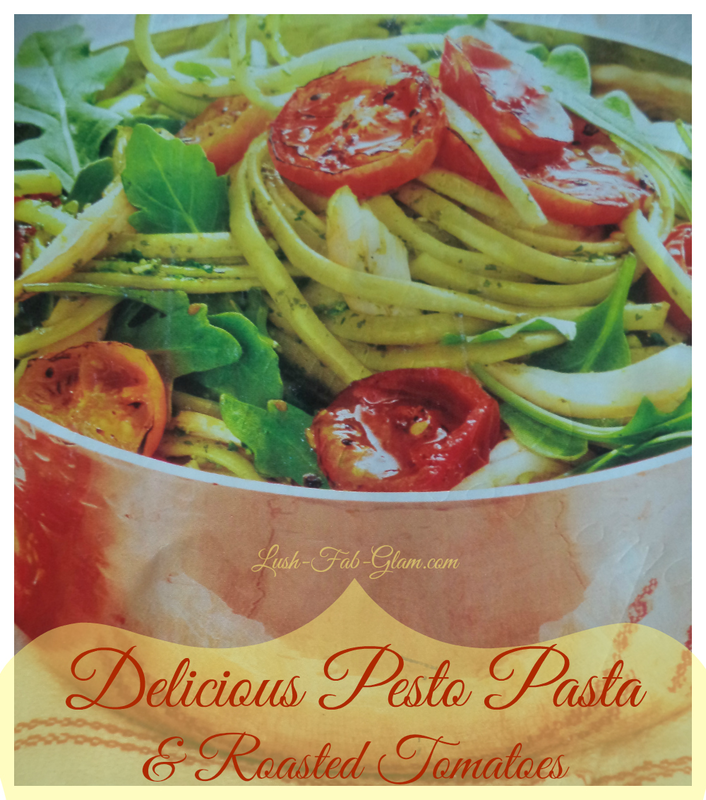 Lush Fab Glam Inspired Lifestyle For The Modern Woman: A Delicious Pesto Pasta And Roasted Tomatoes Recipe For Mother's Day. A Delicious Pesto Pasta And Roasted Tomatoes Recipe For Mother's Day. Mother's Day is almost here and it's officially crunch time for finding or creating the perfect thoughtful gift for mom. This year we are opting for all D.I.Y mother's day gifts including preparing mom a delicious Pesto Pasto with Roasted Tomatoes meal for lunch or dinner on Mother's Day. 2. Halve your cherry tomatoes and mix in olive oil and 1/4 tsp. salt. Season to taste with black pepper and place on a baking tray lined with parchment paper. 3. Place it into the centre of the oven and roast for about 20-25 minutes until tomatoes are soft and golden brown. 4.. Bring a large pot of water to a boil and cook your pasta for about 7-8 minutes until it's al dente. Or simply use the cooking directions on the package. 5. Once cooked drain and return your pasta to the pot, stir in your pesto, add the remaining 1/4 tsp. of salt and extra water if the pasta seems dry. 6. Finally mix in your arugula and roasted tomatoes to complete this delicious and healthy feast! Bon Appetit! Fab Tip: Add 2 cups of shredded chicken (oven roasted or rotisserie) to create an equally delicious Chicken Pesto Pasta with Roasted Tomatoes meal. What will you be doing for or gifting mom this year? Share with us by leaving a comment below. I love it, nothing better than a fresh summer salad... it is time to get those beach bods in shape ladies! This looks like the perfect pasta dish! Pesto is one of my weaknesses- I love it on everything!